Dr. Layne Benzley, children’s dentist in Castle Pines, warns parents that tooth decay threatens the oral health of their children. Despite modern dental techniques, a wide availability of dental products and education in schools, youngsters get plenty of cavities. Flossing is a simple, yet very important, tool to combat decay and gum disease. Learn the basics of this preventive practice and what else you can do to keep children’s smiles strong and bright. Is Tooth Decay Really A Problem For Kids? Unfortunately, it is. Experts at the Centers for Disease Control in Atlanta say that Early Childhood Caries is the most common–and preventable–chronic health issue among youngsters ages two to 11 years of age. In fact, childhood tooth decay is five times as common as asthma. Cavities cause oral discomfort and left untreated, they lead to tooth loss. Loss of baby teeth affects how children speak and eat and how their secondary teeth develop and erupt. In other words, baby teeth are not disposable but serve important functions in development. However, children love sugary treats, drinks and starchy foods. These dietary choices encourage growth of sticky plaque on tooth surfaces, at the gum line and in between teeth. Bacteria in plaque secrete acids that literally eat holes in tooth enamel. Also, decay can begin in infancy. Putting a baby or toddler to bed with a bottle allows milk or juice to pool at the gum line and start the decay process. 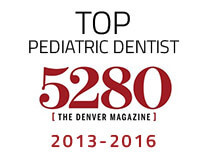 Baby bottle tooth decay is something Dr. Benzley urges parents to take seriously. What Does Dr. Benzley Recommend? Cavity prevention can’t start too soon. When baby teeth being coming in, parents should start the daily brushing routine with a tiny smear of junior toothpaste. As teeth mature and continue to erupt, add flossing–-especially as the space between teeth tightens. Mom or Dad should do the actual flossing until their children have the manual dexterity to do it solo–usually around ages eight to 10. Supervision of morning and nighttime hygiene continues until age 11 or 12. Also, the dentist wants to see little ones for their first check-ups by age one. 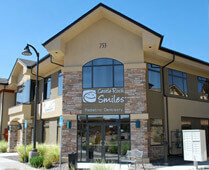 While initial appointments to Castle Rock Smiles Pediatric Dentistry are get acquainted visits, by age three children get full oral exams, X-rays and professional cleanings. The dentist inspects for gum disease, tooth decay, bite, alignment and tooth and jaw development, and he and the friendly hygienist teaches youngsters about brushing, flossing and healthy diets. As young teeth mature, Dr. Benzley usually recommend in-office fluoride treatments and plastic sealants. Both are quick and effective protection against decay. The American Association of Orthodontics recommends children have orthodontic evaluation by age seven to ensure healthy jaw and tooth alignment. Correction of problems early on makes for straighter smiles that are less prone to decay. Preventive dental care at home and at the dental office is key to reducing Early Childhood Caries and gum disease. Flossing is a critical part of that care. So, why not schedule your child’s routine exam with Dr. Benzley today? Babies and toddlers under the age of 18 months receive a free initial exam.